Posted on July 24, 2015 at 12:14 am. 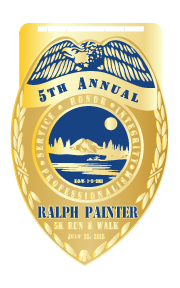 This upcoming Saturday at the Rainer High School the 5th Annual Ralph Painter Memorial Run will began at 8:30 AM. This race is a 10K Run & 5 k Run/Walk to honor Ralph Painter, an avid runner for many, many years. Ralph Painter, a graduate from St. Helens High School, was a long time Columbia County resident serving as the Chief of Police in Rainer, Oregon until he was tragically killed while in the performance of duties on January 5th, 2011. Over the past five years, this memorial race has generated over $20,000 in scholarships for deserving high school seniors in Columbia County. The race is successful because of the runners, walkers and sponsors. Please join the Painter family and other fellow officers on July 25th to help with this cause and to honor Ralph’s memory and ultimate sacrafice. Don’t worry there is still time to participate. You can pick up packet information starting at 7:30 AM. To register online by 11:00 PM on Thursday July 23rd or go to Ralph Painter Memorial 10k Run & 5 K Walk for more information.